Posters will be displayed on panels in the Anchorage Hilton Hotel located at 500 W 3rd Ave just a few blocks from the Hotel Captain Cook in downtown Anchorage. The Anchorage Hilton provides a spacious and convenient location for poster presentations in their ballroom. Site maps are available. You may begin putting up your poster by noon on Monday, January 28. Further details will be provided in an email in January. Restrict the width (side-to-side, either landscape or portrait) of your poster to 48 inches. 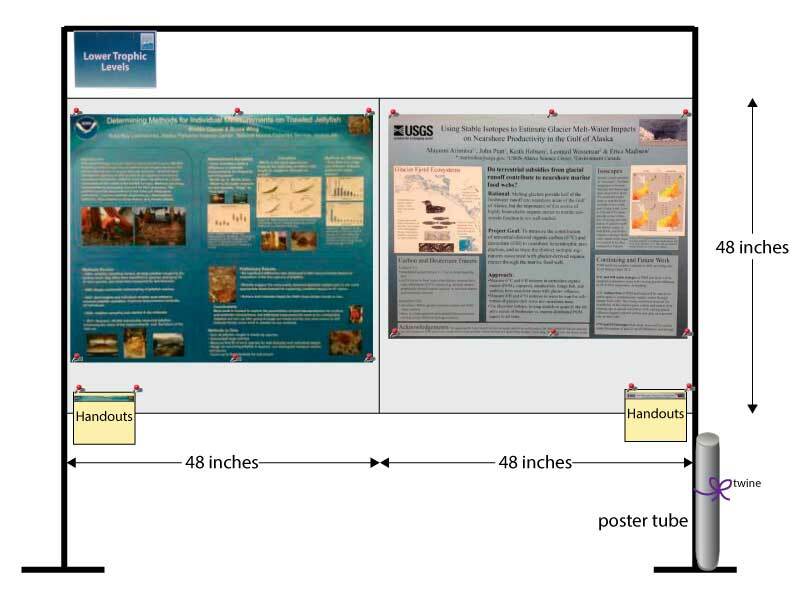 Poster panels are also 48 inches top to bottom; you may choose to have your poster hang off the edges, but it will not be supported.We recommend posters to be less than 48 inches high so there will be room for the handout folder on the panel. T-pins and/or push pins will be provided on the poster panels for your use. Please see this diagram (Poster Board Example) for an example of an ideal setup of posters and handouts on the panel. Presenters will be asked to stand by their posters at different times to alleviate congestion and to help judges with time constraints. We are calling these time periods "waves." Poster presenters will receive an email in early December with their wave assignments. A diagram with locations of all the poster presenters and when they are to be at their station will be available in the registration packets and on this web site at a later date. All posters must be taken down by 9:15 p.m. on Tuesday, January 29. If you do not remove your poster by this time, it will be removed by symposium volunteers. These orphaned posters will be left on a table outside the Discovery Ballroom of the Hotel Captain Cook on Wednesday morning. Once the symposium is over, the hotel staff will dispose of them. For more information, please contact Lauren Boldrick, poster coordinator. You are encouraged to bring handouts of your poster or other related information. We will provide cutaway folders that you will be tacked to the poster panel for holding these handouts. You may leave your poster tube at the poster area IF you tie the tube to the poster board legs so the tube is not on the ground. Twine will be provided for each poster for these purposes. Regardless of the geographic region of the research being presented, posters should be displayed during BOTH poster sessions to maximize visibility and traffic.